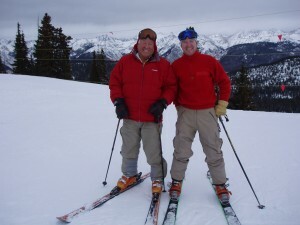 Dad and I on just another great ski day on Vail Mountain. Many years ago, I gave dad a journal as a gift. For five decades he had lived a life in the outdoors of Colorado, backpacking, fishing, hunting, and skiing. He was a pioneer in so many ways – not only as a wild-as-hell, bad-boy patrolman, but also as one of the first kayakers in Colorado, and probably the best dry-fly fishermen I’ve ever met. He has a lot of stories to tell. To be honest, I never thought he’d actually write a book. But when he was diagnosed with stage four melanoma, the project took on a whole new meaning. We knew his stories would be important for us as a family, to pass down through the generations. We also knew that he and his buddies had created the foundation of the outdoor culture here in the great state of Colorado. It’s important for us young ‘uns to keep our fathers and forefathers in mind as we build toward the future. Sometimes we can learn from the past … even if that learning comes in the form of what NOT to do. When my boys make mistakes, this book will help them look back and say, well, I guess grandpa made the same ones, and he turned out OK. And when my boys someday get lost in the mountains on a winter night, they won’t panic. They’ll have grandpa’s wisdom to keep them calm, and they will keep trekking onward toward home, where a warm fire is always waiting. Against all odds, Dad won his fight against cancer. It was a hell of a battle, but he’s pretty damn stubborn. All throughout he was writing, and he kept going and going until he basically had a book. We joined together with some other patrolmen, lead by Jim Himmes, and gathered all the stories together in this volume. We got some amazing support from Pam Timmons, who really made the thing happen in the end. Thanks Pam. My mom, who had to live through all those days, says they aren’t quite so pretty up close. But even she had a few laughs and enjoyed the draft copy I showed her. I wouldn’t have gone to print without her approval. Thanks mom. Printing is pretty expensive in this day and age, especially when you don’t really have a big-budget publisher at your side. Paul Testwuide and Chupa Nelson deserve a really, really big thank you for making this happen. With their help, we had the money to take this to the print shop. We wanted to stay small and stay local. Thanks to Enviro Friendly Printing in Littleton, who guided us through the process and helped us print and bind this full-color book. I took dad’s notes and he and I typed them out together. We spent hours and hours, years really, going through the process. In the end, however, we needed to call in a professional. Rosalie Isom came through for us, putting a large portion of dad’s stories down on paper, editing as she went. Thanks Rosalie. After that it was a matter of laying it out. I took some of my knowledge from my newspaper days and laid it out in Adobe InDesign. I did my best to avoid mistakes and make it look nice, but my hope is we can sell through this batch and do another edition with even more stories and photos from Vail and Aspen pioneers. Either way, this has been one of the most enjoyable projects I’ve ever been a part of. Thanks to everyone on patrol for all you do, and a special thanks to Dad and all the people who made this book happen.